This past Friday, I hosted the craft activity that our homeschool group tries to do once a month at one of our homeschool family's homes. As soon as I read Lacy's email from Catholic Icing on how to make a Sock Baby Jesus with No Sewing, I knew that was the perfect craft for our bunch! Before we started the craft, I read a great children's book about the first Nativity that began 800 years ago by Saint Francis of Assisi. The title of the book is Saint Francis Celebrates Christmas. I showed the children our statue of St. Francis and asked what he is well known for. They all blurted out how he was kind to animals and blessed them. I then asked if there is something else he is known for, especially during this holy season. A few children answered that he started the first Nativity as he gathered animals and people for a live Nativity. It's a great story and book! 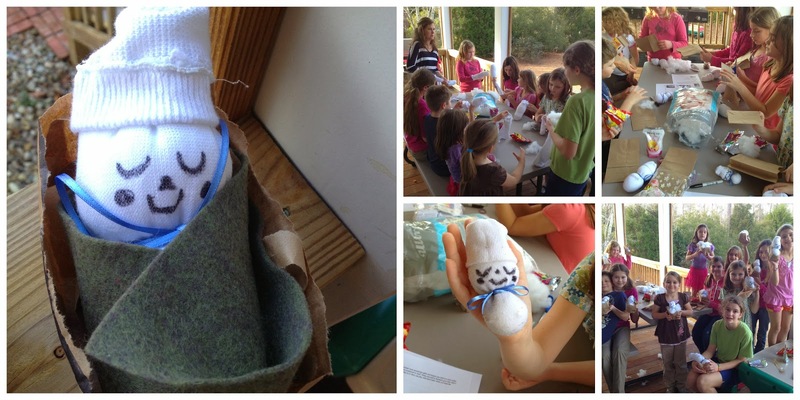 After I read the book, we started our Sock Baby Jesus craft. Everyone loved it! Thanks Lacy for the idea! Last night our family added to our "Handy Tree Skirt" that we have been doing each Christmas since 2008. You can see my original blog post about the skirt HERE. HERE are a few pictures from last year's tree skirt printing. Below are a few pictures from tonight's hands on fun! My cupcakes love to compare their hand size from year to year. Here is one of my daughter's comparing her print from 2012. We love seeing our tree skirt fill up each year with big (and little) handprints! 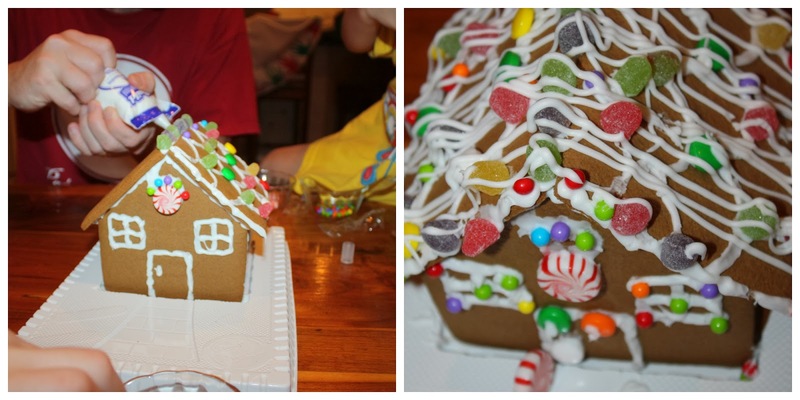 Last night we made our annual gingerbread house too. Besides the festive traditions above that we do each year, we have also done these fun activities from the past and some of them we still do each year like making the Bua Bark, pretzel treats, and a birthday cake for Jesus. I remember your handy tree skirt from years past! LOve it. Looks like the kids had so much fun! 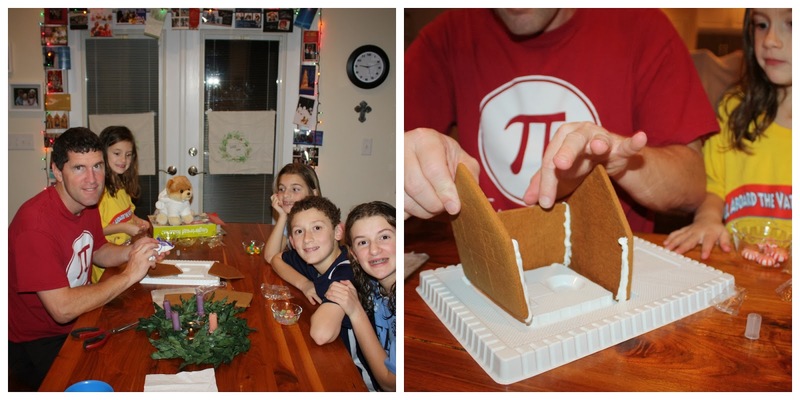 AND your son's PI shirt is so cute too. We are putting up our tree today after mass and tmrw, ggbread houses. Have a great day and thx for sharing! That sock baby is so cute! We love that St. Francis book too. Merry Christmas!